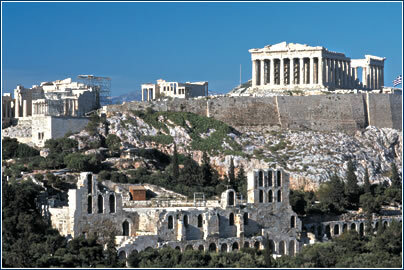 Just mention the name Athens, and one conjures up images of gods and goddesses, warriors and poets. With its ever-present sea and sun, amazing sights, and welcoming populace, the “Paris of the Mediterranean” is a dream destination for pleasure-seekers and business travelers alike. Advice: Remind the taxi driver to turn the meter on! Advice: Be extremely careful while driving in the rain. Water and dust on the asphalt road mixed with marble rubble create a greasy emulsion and the road surface is like ice. Best-kept secret: Lycavittos – A somewhat forgotten place with a beautiful view over Athens. Favorite shop: I can recommend typical small greek shops in Pireum; avoid the big supermarkets. Advice: Do not travel by car into the center of the city, particularly during the rush hours. Best-kept secret: Athens is a very open and lively city, unfortunately there are not many places still remaining a secret. However, you can go to Psirri, a very popular place, but one where you can still discover small and cozy places to sit for a drink without being crowded. Advice: Avoid going to the center of Athens in the rush hours. It is better to go for a walk in the evening. During the day, I prefer to go for a walk across the shores of Faliro, Glyfada, Vouliagmeni or Voula. Ethnic mix: Vast majority Greek with small minority of other nationalities. Religion: 97% Greek Orthodox majority; Muslim, Roman Catholic and Jewish minorities. Time zone: GMT + 2 (GMT + 3 from last Sunday in March to last Sunday in October). Electricity: 220 volts AC, 50 Hz; round two- or three-pin plugs are standard. Average January temp: 9.5° C (49° F). Average July temp: 27.5° C (81.5° F). Annual rainfall: 376 mm (14.5 inches). 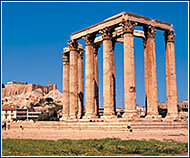 http://www.worldexecutive.com/cityguides/athens/ – as the URL suggests, this site specializes in helping executive travelers find the best deals on hotels, while offering a perfunctory guide to the city. 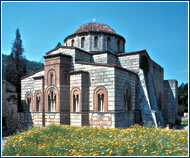 http://www.abasefortravelinfo.com/athenscitytourism.html – a bland but useful portal page, where users can find many other related sites with more in-depth info. http://athens.cybercityguides.com/mainindex.html – an easy-to-use, but somewhat sterile guide to the city, via links in various categories. http://www.gogreece.com/travel/select.asp?CityID=46 – part of the slightly more hip “go Greece” travel guide series. http://www.athensguide.com/ – the “Athens Survival Guide” offers the site moderator’s insider tips to places to stay, things to see, and where to eat and drink . The public sector is a dominant force in Greek economy. Tourism is the largest industry, with turnover estimated at USD 10 billion, accounting for about 8.5% of GDP. Greece is a key link to the emerging markets in the Balkans and the eastern Mediterranean. As the only EU state in this part of Europe, the country is regarded as a zone of relative economic and political stability within a volatile region. 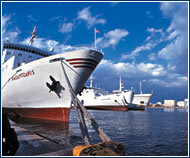 Greece has the largest merchant marine fleet in the world, with an 18% share of international commercial tonnage. The Athens metropolitan area accounts for most of the country’s industry: tourism, textiles, machine tools and shipping are among the key sectors. The award of the 2004 Olympic Games is prompting a surge of investment as well as major construction projects to accommodate the influx of visitors. The working day in Athens is fairly flexible. In general, offices are open 8:30-16:30, although shops and banks may have different hours (smaller organizations still close for a siesta in the afternoon during summer).